Through a lot therapy, prayer, and support from some of the most amazing people, I am finally finding a way to move forward and onto this next chapter of my life. One of the things my therapist and I talk a lot about is letting go of the past, forgiving myself for my mistakes, and what steps I need to take to get myself to a place where I can take down these walls I've built up and open myself up to all the possibilities my future holds. One of the ways I'm doing that is through a series of letters and staged readings. This is my way of getting all of the things out that I want to say to the people who have hurt me, and to the people I have hurt. We are choosing to do this through the medium which I express myself the best: writing. Recently I posted my first of these letters. If you haven't checked out my post, Dear Monster, you should. It's raw, emotional, and everything I have wanted to say to the person who has hurt me the most. That post was the beginning of many letters. And today I want to share with you the one I wrote to the person I have hurt the most. This is a deeply personal letter. One that caused a lot of tears and drafts before it was finally done, and this is probably the first thing I have ever hesitated to post in all the years I've been blogging. But, I feel like this letter is a crucial piece of the puzzle. The final words of not just a chapter, but a short story. A beautifully tragic short story that has probably played the hugest part in who I am, where I've come from, and where I'm going. This is the last love letter. This letter has been a long time coming. For months, I've been writing and re-writing the words of this letter over and over again in my mind until today. Today it all leaked out on paper in the way it was meant to be written. Yes, there have been times during this part of our journey when the words that would have spilled out onto paper would of been hateful. There were times when my words would have been too sweet and too sincere. There were times when my words would of been laced with desperation, remorse, and entirely too heartbreaking. And there were times when my words would of been nothing short of vindictive and self-righteous. But, I know now more than ever that for me to have written a letter that reflected just one of these emotions would of been a mistake. In order for this letter to say what needs to be said, it had to be a beautiful mixture of all of them. So, this is your letter. Our truth on paper. If I were writing the last few pages of our story, this is what it would say. 10 years ago, I fell in love with an awkward, gangly 16 year old boy. I'm still not sure how you swept in and stole my heart from Matthew Crutchfield, but you did. I will never forget that first kiss on the tailgate of your first truck or all the weekends spent at the movies when we were pretending to "just be friends". Do you remember that time my sister and I stood you and Zach Moorhead up at the movies and you got in trouble? Yeah. Those were the days. I will never forget all the ski trips, youth functions, and all the nights we pushed curfew. Every look. Every touch. Every kiss. Every single moment from those early days is tattooed onto my skin. They will forever be apart of me. After those early days, there was college and our attempt at a year of long distance relationship. How a couple of crazy kids like us survived that, I will never know. There were late night phone calls that usually ended with you sleeping on the phone with me, so I wouldn't be scared. There were Friday afternoons of cutting class so I could come home to you sooner. There were early morning drives on Monday just so I could spend one more night with you. There were long kisses and even longer goodbyes, and all of those moments-each and every one-were filled with so much hope and promise. And after a year, against my parents wishes, I moved home. I was tired of the homesickness and being apart. I was ready for our life, and so were you. Our first house and then our engagement followed shortly after your graduation. There was a wedding and a honeymoon, and then we settled into life. Life where a couple of crazy kids pretended to be grown ups. We had no idea what we were doing, but we did it. We laughed and we fought-God, did we fight. We made memories, we had milestones, and we survived. We survived every single struggle and and we opened our hearts to every possibility life threw our way. It was crazy. It was beautiful. And we loved each other-really, truly loved each other. And then there was her: Emma Grace-beautiful, perfect little her. She came long before I was ready, but she has been our world since the very beginning. In all of our years, despite all of our hurts and mistakes, she is and will always be our greatest accomplishment. The one thing we did right. We will spend the rest of her life trying to make the last four years up to her. I have accepted that. I know that some days we will fail, and other days we will succeed. I know that finding the perfect balance is going be a challenge, but I know that with time we will figure it out. She is what's left of our legacy. She is our one chance to prove that we were not a mistake, and I hope that no matter what we can come out on the other side of this for her. I'm not sure when we fell apart. I can't quite put my finger on the exact moment or time. Mostly, because it was compilation of things-a wearing down. When I was 18, I thought our love was strong enough to overcome any struggle. I know now that I was wrong. There were hurts-so many hurts on both sides. We both have had our hand in damages that will never quite heal right, and that will always leave scars. Instead of growing up together, we grew apart. Little by little-mistake by mistake. And we were both to stubborn to admit it until it was to late. We tried...not as hard as we could have...but we did try. Both of us at different times. Never quite able to get our steps in sync. And so we resigned to failure. Both of us giving up. Both of us walking away. And just like that, 10 years of our lives summed up by a parenting plan and a list of assets. And as I cried on the stand that day and answered their monotone questions, I wondered is this all they'll remember of us? This fleeting moment, this banging of the gavel, and the flourish of ink as we write names on paper. What about our story? Where does in fit into all of this mess? Because you and I both know there was a story. A really beautiful one. A story where the gangly boy of 18 was sleeping on the phone with his girlfriend who lived an hour away so she wouldn't be scared, and where the awkward girl was moving home and was driving 45 minutes to class a few nights a week just so she could ride shotgun with that boy on the nights she wasn't studying. A story where he proposed to her on the couch in the living room of their new house after a big fight about why he hadn't proposed yet. A story where their car broke down as they were leaving the church for the honeymoon. A story where she cried when she found out she was pregnant and his face lit up like she'd hung the moon. A story. Our story. Proof that maybe as hard as it was, it wasn't all bad. Those were our moments. They shaped and molded us into the people we are today. We will be better future spouses and parents because of the lessons we learned while we were growing up together. I will always be grateful to you for those moments. Always. I want you to know, that I will always love you. My very first love. You have given me the greatest gift I didn't even know I needed, but couldn't imagine my life without: our daughter. You have been my best friend and my confidant for the last 10 years. You have coached me through some of the hardest moments in my life: my parents' divorce, college, my pregnancy, my Grandma's bypass surgery, my Grandpa's death, and the death of my sweet Eden. You held my hand through all of those moments, and for that I am grateful to you. I know we did A LOT of things wrong. I know we fell apart to soon, and I know I will always have these regrets that I will carry around inside of me for as long as live. But, I refuse to believe it was all bad. I refuse to believe that we were a mistake, because in my mind a mistake is the last thing we were. We were just a couple of crazy kids trying to make it, and we didn't. But, we made some amazingly good memories along the way, and that's what I'm clinging too. In the midst of all this, I am choosing to cling to the good, because that's the only way I'm going to make it through. So, this is goodbye, love. 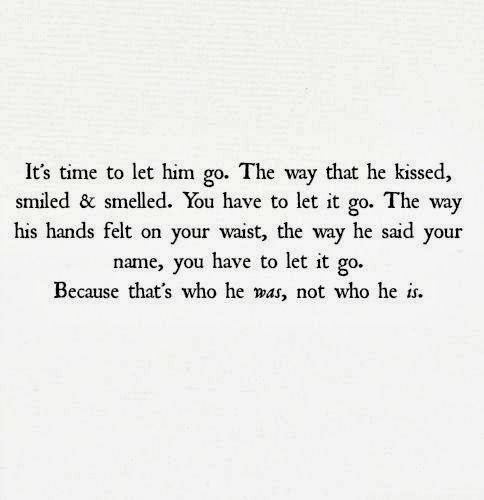 This is me letting you go. I pray that somewhere in this great big world you find happiness, and that you never lose sight of the important role you play in our daughter's life. I know God has a plan for you, and I'm sorry that we messed it all up so I could no longer be apart of it. I know you'll be okay, and so will I. And we will continue to work on this whole being "friends" thing for Emma until eventually we get it right. I want you to know that as much as I've cursed you and us throughout the last few months, deep down inside of me, I'm glad you're not going away completely. I'm glad that for the next 14 years, I have to parent with you. I'm glad, because as hard as it will be for me, I will get to see you be okay. I'll get to witness your success and your happiness, and in some weird way that will be some sort of balm on all of these wounds. It will rescue my sanity to know that we didn't mess each other up completely. That we are still able to function and move forward-scars and all. I hope you know that I want the best for you. I truly do. And I hope someday you find it. But, I also hope that you never lose sight of the story that brought you to where you're going. I know that I won't.